Felovite II is a highly potent vitamin and mineral supplement fortified with taurine. Felovite II comes in a tuna flavored paste which makes giving vitamins to your cat easy. With its high-potency formula of vitamins, minerals and the all-important taurine, your cat's daily dose will round out nutritional needs. It's doubtful that your cat will not submit to the allure of the taste of tuna. If need be though, you can stimulate your cat's interest in Felovite II by placing a small amount on your pet's nose. per teaspoon; Calcium (67mg), Phosphorous (52mg), Potassium (0.07mg), Sodium ((2.09mg), Chloride (1.92mg), Magnesium (3.98mg),Iron (0.76mg), Copper (0.10mg), Manganese (0.24mg), Zinc (0.31mg), Iodine (0.25mg), Vit. A (1296 IU), Vit. D (129.60 IU), Vit. E (5.28 IU), Vit. K (0.80mg), Vit. B1 (1.21mg), Vit. B2 (0.72mg), Pantothenic acid (3.61mg), Niacin (6.61mg), Vit. B6 (1.26mg), Folic acid (38.1mcg), Biotin (6.64mcg), Vit. B12 (5.18mcg), Choline (27.60mg), Taurine (94.50mg), Cobalt (0.07mg), Inositol (1.35mg). Felovite II with Taurine is a tuna flavored vitamin and mineral supplement for cats and is fortified with Taurine. Felovite II with Taurine is available as a non-prescription (OTC) product. The usual dose for cats is 1 level teaspoonful daily and for kittens is 1/2 level teaspoonful daily. 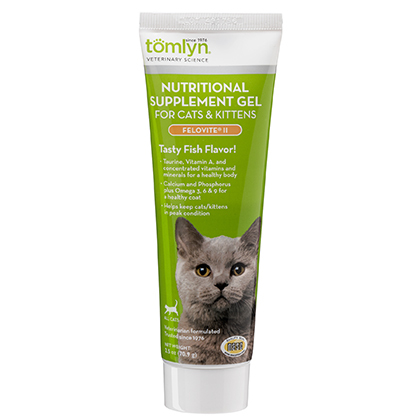 To stimulate taste interest and to have animal freely accept this product, place a small amount on your cat's nose. Store this product in a cool area. Keep out of the reach of children. Felovite II with Taurine is a tuna-flavored vitamin and mineral supplement for cats. This product is for use in cats and kittens only. Do not give to dogs. 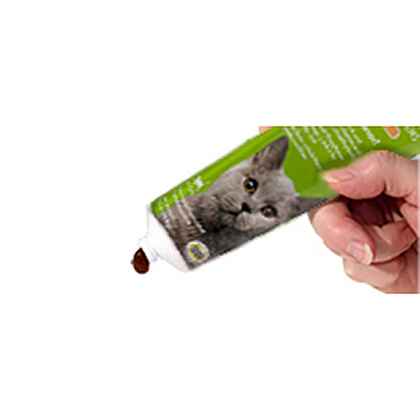 To stimulate taste interest and to have cat freely accept this product, place a small amount of the paste on the cat's nose or in the mouth. Store this product in a cool area.